A fossil bone from a Tyrannosaurus rex, recently discovered in Wyoming sandstone, bears the telltale signs of having been gnawed and stripped clean of its meat — by another tyrannosaur. 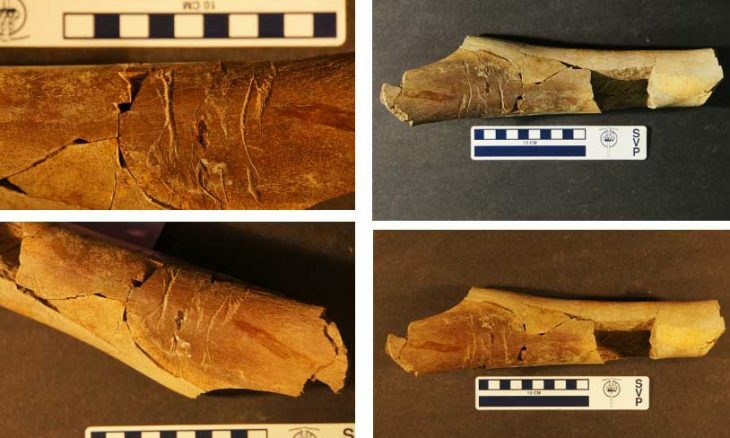 The long bone, found in sediments dating back 66 million years, clearly shows 10 deep grooves made by serrated teeth — the first tyrannosaur bone found to have such teeth marks, paleontologists say, and the first evidence that T. rex was eaten by its own kind. The signs of Cretaceous cannibalism were clear enough that scientists spotted them immediately in the field, according to paleontologist Matthew McLain of Loma Linda University, who reported the find. “We were out in Wyoming digging up dinosaurs in the Lance Formation,” McLain said, in a press statement. The deep, U-shape scores were up to five millimeters wide [about a fifth of an inch] at some points, he reported. And in addition, the scars on the bone ran perpendicular to the length of the bone, suggesting that the flesh was pulled from the T. rex bone much as meat is eaten from a chicken’s drumstick. Moreover, at the rounded end of the bone, a set of smaller, parallel grooves was found, made as the eating animal turned its head as it pulled the flesh, leaving serrated striations behind. Since the only theropods found in the Lance Formation, in north-central Wyoming, are tyrannosaurs — including T. rex and Nanotyrannus, which some scientists believe may truly be juvenile specimens of T. rex — the only conclusion is that this T. rex was cannibalized by one of its own. But the clear serrations from the teeth marks may allow future research to pinpoint which species managed to eat the famous predator. 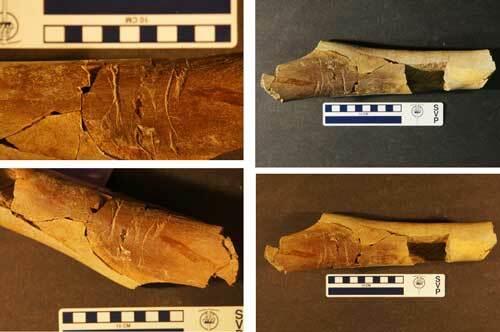 “Exactly who did the eating that day, in the Late Cretaceous, could still be sorted out by the same grooves,” McLain said. Specifically, the nature of the serrations can provide data about the size of the animal that made them, which in turn could settle whether the dinosaur that did the dining was T. rex or Nanotyrannus. “It only works if you know what species it is,” McLain said. McLain reports his team’s findings at the annual meeting of the Geological Society of America in Baltimore.